Don Nichols has been a member of the parish since 1961. His latest stained glass pieces, “Wedding at Cana”, is located in the Bridal Room of the church. The Wedding at Cana project took about 15 months from concept to installation. Finding a doable picture, converting to proper size and design suitable for stained glass assembly, deciding on the type of glass that would be pleasing to view with or without back lighting, and selling the concept to Father Michael took time. My stained glass mentor said that the design would not work using conventional lead and zinc techniques. 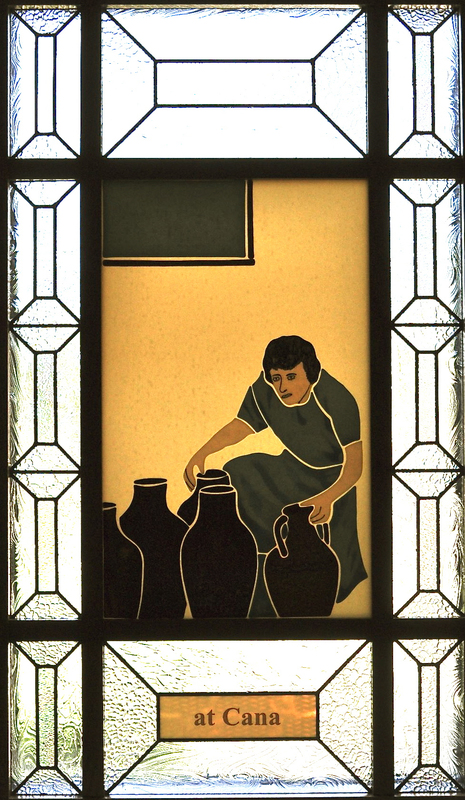 She suggested fusing the individual pieces of glass to a larger piece of background glass instead of leading. When Father saw the Photo Shop altered picture he gave his OK and I was off and running. The next challenge was creating the folds and shadows in their garments. My mentor introduced me to fritting. Using self created templates I carefully deposited powder fine glass of different color and thicknesses on the garment shaped pieces and fired to 1250-1485 degrees. My first firings were a disaster. My old ceramic kiln was not accurate enough. This problem was solved by buying an electronically controlled glass kiln. By Christmas week the Mary and Jesus window was ready for final firing. During Christmas week I received word that the firing was complete. Mary and I went to bring it home. It looked great but when I picked it up and put it on the carrier to transport there was a distinct PING! It had cracked and was a total loss. Mary and I stood in shock. My mentor decided that the single sheet background glass (1/8”) was over stressed and that next time we should use double strength glass (1/4”). Father looked at the cracked partial picture and was OK with everything except for Mary and Jesus’ eyes. In retrospect they were pretty bad. At this point it was decided that the project was going into two windows. Extra water jars were added in order to reflect the biblical account and a window border and sky were added to reflect daylight hours. These were split between the two windows to tie both halves of the picture together. The 2nd window with the servant was successfully fired on double strength background. After three more attempts to produce satisfactory faces, the other half was successfully fired. Each of these firings reached 1485 degrees and took in excess of 24 hours. With an exact size now known for the center pieces, Jerry Murawski was able to convert my rough sketches into furniture quality frames. The border glass and design was created to let light in but because of the glass textures provide privacy for the bride. The patterns are mirror images of each other. They all went into place without a problem. From day one I prayed daily for the ability to complete this project. My wife Mary provided suggestions and a ton of encouragement! Don & Mary Nichols have been Mary Immaculate parishioners since 1961. Mary taught at MIS for 28 years. Five of their children attended MIS.